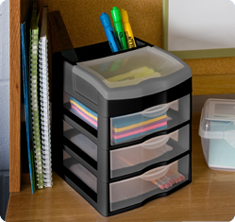 Control everyday clutter and keep desks, countertops, and shelves clear and organized with Countertop Drawers! These multi-purpose storage solutions can be used in any room of the home, for crafts, office supplies, jewelry, first aid supplies, beauty items, and more. The 3 Drawer Desktop Unit features three clear drawers that neatly contain items but still allow contents to be easily identified. 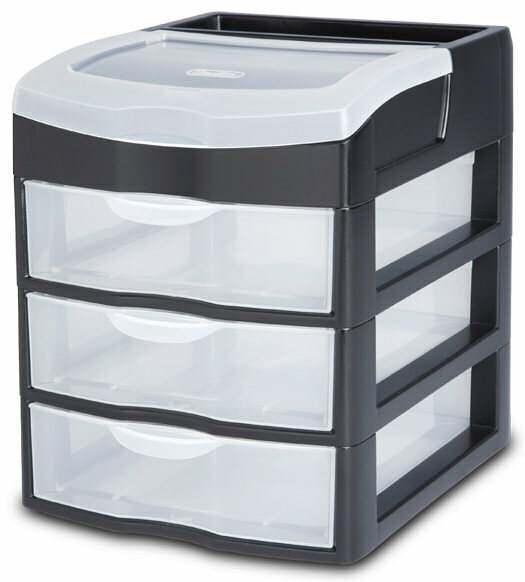 The clear, flip-top compartment allows for quick access to frequently needed items, such as paper clips, sticky notes, thumb tacks, and various other office supplies. The rich black frame coordinates with most home or office decors making it ideal for desk or countertop organization. The overall assembled dimensions for this item are 8 1/2" x 7 1/4" x 8 1/2". Overall Assembled Size: 8 1/2" x 7 1/4" x 8 1/2"
Ideal for organizing and accessing those items used most frequently like pens, binder clips, sticky notes, or small accessories in an office or around the home. 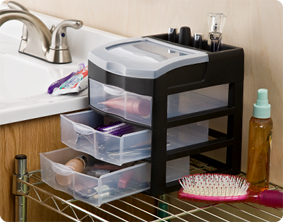 A 3 Drawer Desktop Unit makes a great bathroom organizer – keep those hair accessories and beauty products organized! 3 Drawer Desktop Unit is rated 5.0 out of 5 by 3. Rated 5 out of 5 by Wide drawer storage from Awesome! I own two of these desk top sized drawers: one sits on my bathroom counter and houses all of my make-up; the other is in my classroom and perfectly holds 8 1/2 X 11 papers. The drawers are durable and easy to clean. I man on purchasing more. 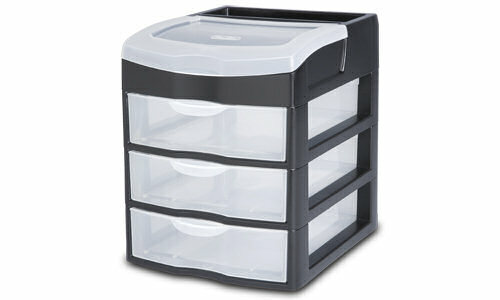 Rated 5 out of 5 by Ivy from Excellent features I use this item to organize my office products. The variety of drawers and compartments allows for easy reach and the transparency of the drawers lets you see what you are reaching for without having to open every one to find it. Rated 5 out of 5 by pudge24 from Great storage! This is a smaller storage unit. I use it for all of my hair accessories in my bedroom. Durable as I have dropped it a few times and it has not broken or cracked. Highly recommend!